Dedicated to helping older adults live independently at home for as long as possible, the Greater Lewes Community Village is an independent, grass-roots, nonprofit volunteer organization that enhances the lives of member individuals and families. The Village was introduced in Lewes in 2010 — and expanded to Milton, Rehoboth Beach, and other communities in Sussex County — to meet the growing needs of the older adults in our community, and to keep them engaged in a variety of social, educational, and cultural activities. At the May Health Care Commission meeting, commissioners and members of the public learned about this effective community resource. The Village is guided by a 14-member board and a 16-member advisory council. Memberships are $500 per individual or $750 per household, and can be subsidized for those with financial hardship. Jackie Sullivan, executive director of the Village, recognizes the uniqueness of the model: “We bring people together from all walks of life for a common goal,” she says. “We are part of a growing network of 240 Villages across the country.” Services include everything from providing transportation to medical appointments or social events to helping with yardwork to picking up a prescription to changing a lightbulb or smoke detector to just sitting and chatting or doing a puzzle. The need for elder support in Delaware is pronounced. Delaware’s population is the seventh oldest in the nation. Most people want to continue to live at home as they age. Volunteers are a vital part of the service model. But the Village also works with a myriad of organizations to make additional services possible. Meals on Wheels, farmers’ markets, and Beebe Medical Center are just a few of the Village’s collaborators. The relationship with Beebe includes a grant-funded effort involving physician practices and wellness centers. 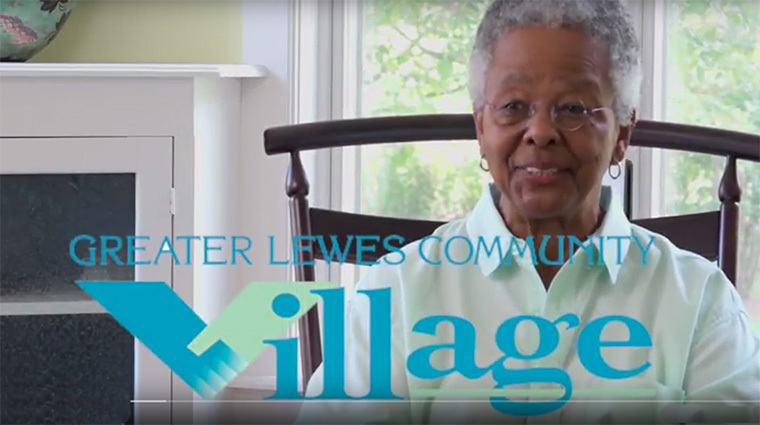 The Greater Lewes Community Village primarily provides transportation, but as Ms. Sullivan comments, “This is about the whole person — letting them tell their stories and have someone to talk to.” Village volunteers serve as a second set of ears in the doctor’s office. And they can do fun things too, like celebrating landmark birthdays. “Those are the moments of joy that matter to both the older adult and the volunteer,” Ms. Sullivan says. Currently, the Greater Lewes Community Village has 167 members and 115 volunteers. The overarching goal is to make the aging adult the person in charge of decision-making — empowering them to live the life they wish to live. As the Village continues to grow, it is always in search of assistance to support the growing population of aging adults in Sussex County, and looks forward to any new relationships. “We see this as the ideal opportunity for people with common goals to come together for the betterment of the community,” Ms. Sullivan says. Learn more about the Village at www.greaterlewescommunityvillage.org.